Finally, a jam that is high in both sugar and fat! Confiture de Coco/Coconut Jam is delightfully sweet and coconutty with so much potential as a topping or filling for so many sweet treats and desserts. I first discovered coconut jam while in New Caledonia. I was immediately smitten with it’s taste and dessert potential and so I was very disappointed when I was unable to buy some before I left. I have tried a few different recipes for coconut jam but this one best replicates what I ate in New Caledonia. 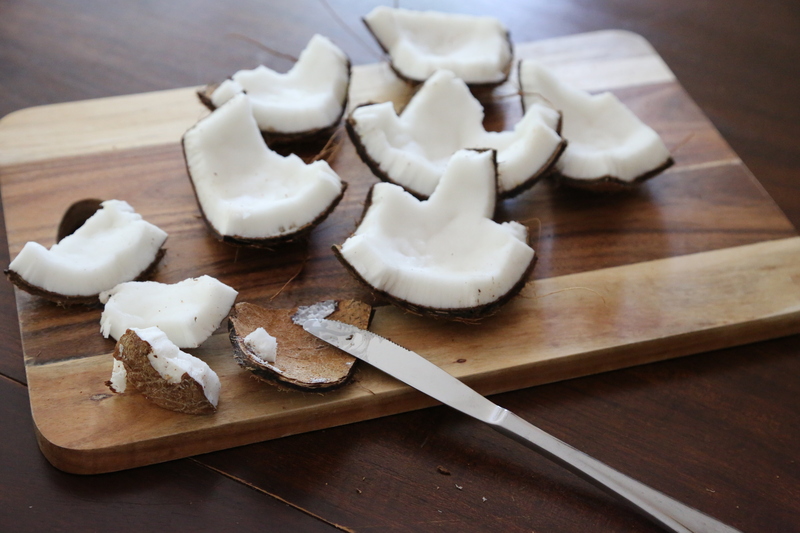 Fresh coconut flesh gives the best results. I did try making it with unsweetened desiccated coconut but it wasn’t very good; it was rather chewy. Removing the flesh from the whole coconut and grating it is a little bit of a bother but the results are worth it. 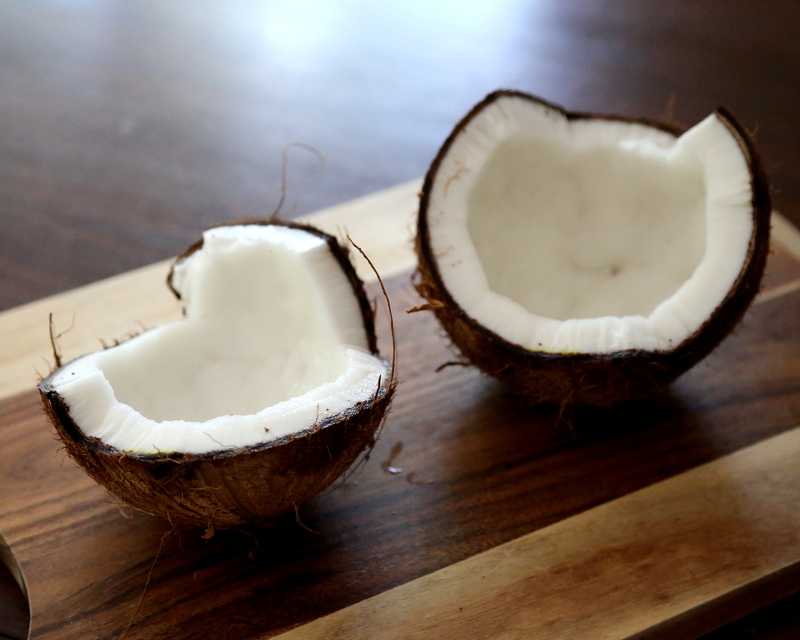 I’ve included some step-by-step photos if you’re unsure about how to handle a whole coconut. 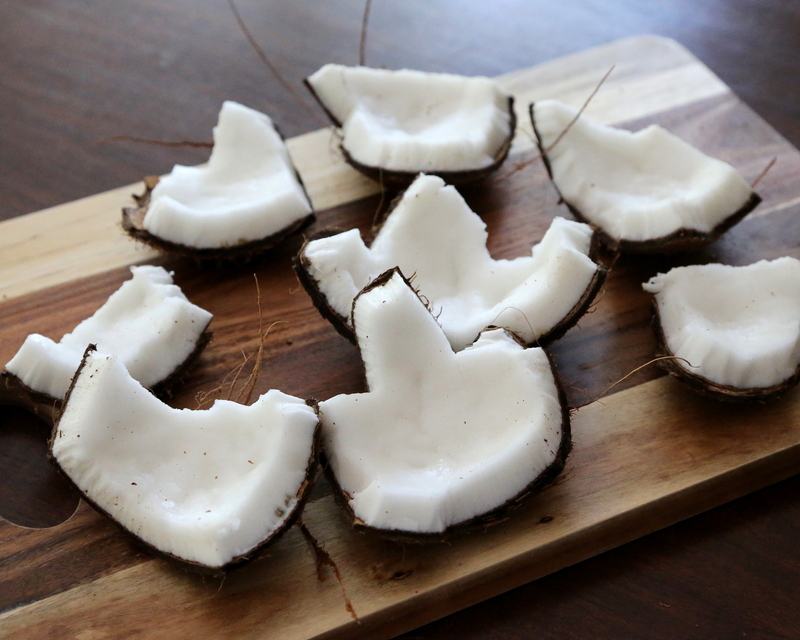 One whole coconut will yield enough flesh for this recipe and a little extra for snacking. The correct place to start is by piercing all three eyes of the coconut, the weakest part of the shell, to drain the coconut water. I lost patience with this step very quickly and simply smacked it really hard with the hammer (it would be wise to wear safety glasses for this; seriously). I did lose some of the coconut water but I caught most of it in a cup. 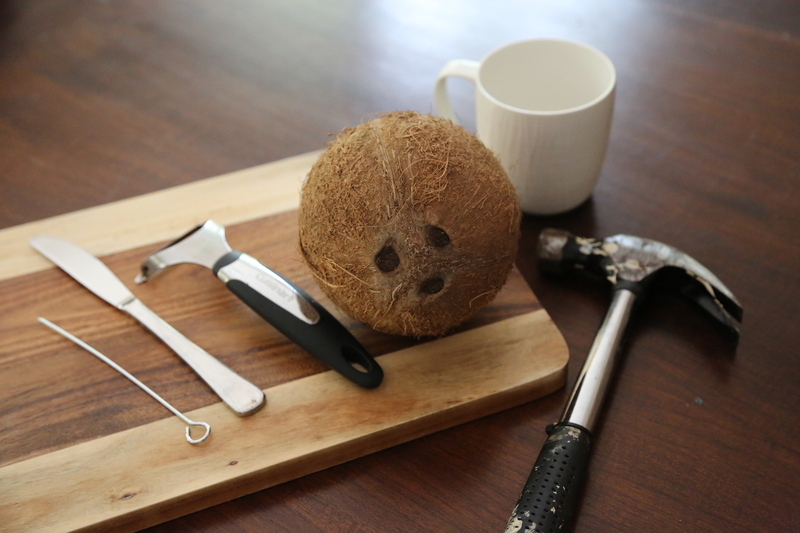 After draining the coconut water, break the coconut into several pieces using a hammer (and don’t forget the safety glasses!). With a butter knife, prise the flesh from the outer shell of the coconut. The brown husk will still be attached to the flesh and this can be easily removed using a vegetable peeler. 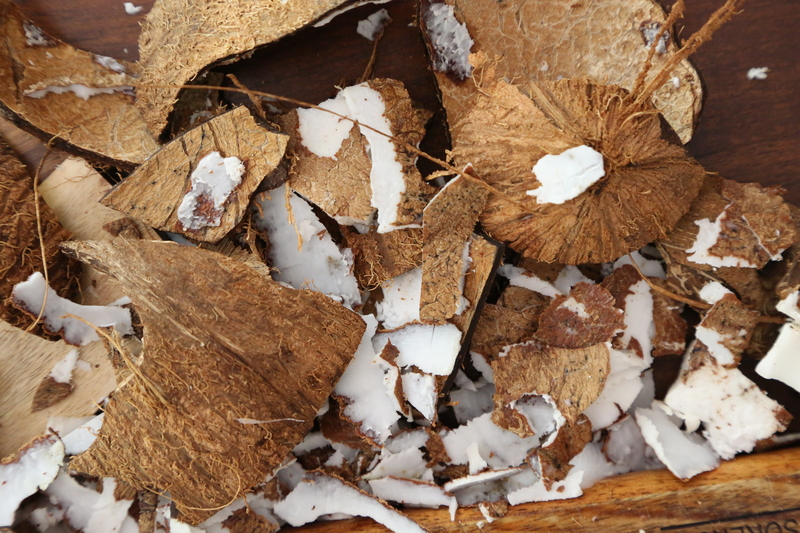 By now you’ve made quite a mess so clean up and rinse the coconut flesh to remove any bits of husk and shell that have stuck to it. 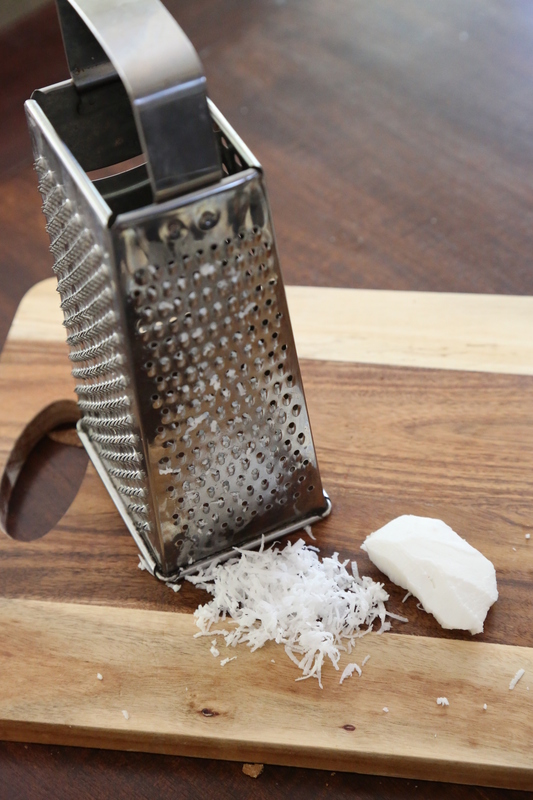 Finely grate the coconut flesh using a box grater (or a food processor if you want to save your manicure). 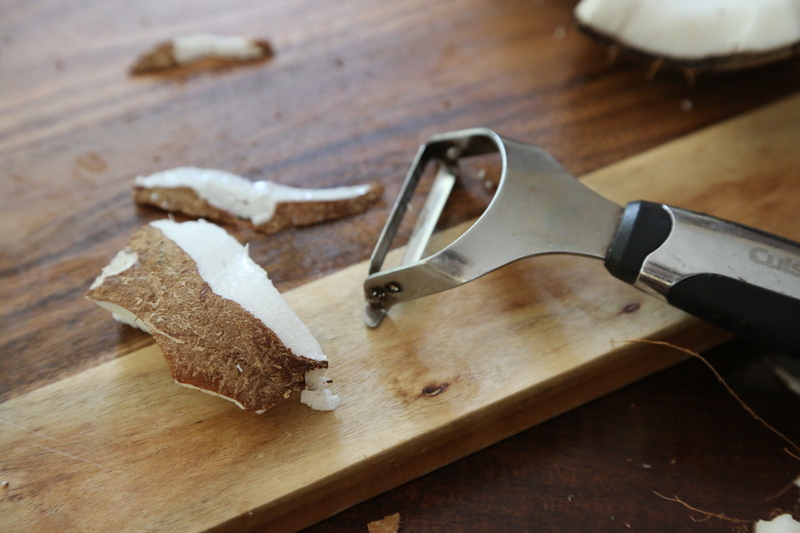 The amount of time it takes to remove and grate the flesh will depend on your coconut. The first time I made this recipe it only took about 20 minutes to compete this part. The flesh on the second coconut I used was very firmly attached and it took much longer. For this coconut it worked better to break the coconut into smaller pieces before trying to remove the flesh/husk from the outer shell. 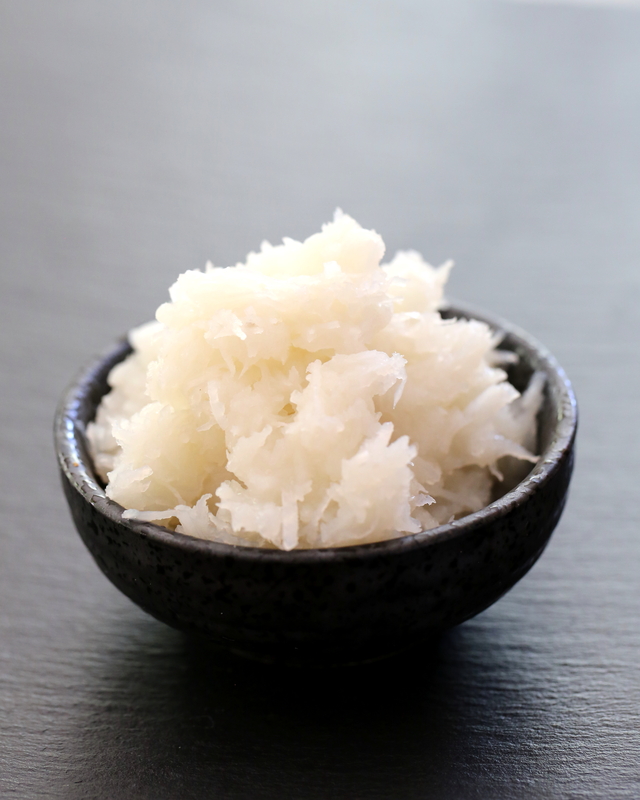 Place the finely shredded coconut, coconut milk and sugar in a saucepan and heat over medium heat until it is thick and jam-like and the coconut looks translucent (about 10-15 minutes). I have stored my coconut jam in the fridge. I’m expecting it to be eaten fairly quickly! Posted in JamTagged coconut, confiture, food, food photography, gluten free, jam, new caledonia, vegan, vegetarianBookmark the permalink. Thanks Monica! It makes a great filling for homemade chocolates! Pingback: Make a Coconut and Argan Oil Hair Mask | DIY - By Brittany GoldwynBy Brittany Goldwyn - Making Life Simpler.